I picked up the Ruger 357 Super New Blackhawk 357 Maximum a few years ago when I was working at Cheaper Than Dirt. The gun came in on a trade-in and was priced reasonably. It was not something you see every day. I bought it, not because I needed it, but because I liked the way it looked. I’ve read the history of Ruger’s venture into the 357 Maximum and know that Ruger recalled the revolvers some years ago because a few folks who loaded overly hot rounds for long-range steel plate competition experienced some issues with top strap burning. My revolver shows no indication of any such problems. Prior to my ownership, it doesn’t appear to have been fired much at all. I’ve put approximately 21 rounds of 357 Maximum through it along with a box of 357 Magnum and maybe a box or two of 38 special. Mostly it just sat in my gun closet and looked pretty. As much as I liked owning it, there was something not quite right about it that kept me fromshooting it much. Then it hit me. It was that 10 1/2 inch barrel. I’m not into handgun hunting or long range target shooting with a handgun and that long barrel made the gun unweildy to carry and out of balance to shoot. I talked to my partner Jerry Colliver about shortening the barrel to 6 inches and he agreed to help me. Actually, Jerry had the tools and the experience so he did most of the work while I took pictures. We measured 4 1/2 inches back from the muzzle and marked the location of the cut with electrical tape. I wanted to make sure our cut was perfectly perpendicular, but Jerry assured me that at this point it only had to be close. Jerry cut the barrel using an air-driven diamond cutter. Next came touch up work on the small grinder. After the grinding came hand filing. The objective was to eliminate the courseness from the grinder wheel, leaving the metal surface as shiny as possible at this stage. The factory barrel end had an inside bevel around the bore and an outer bevel around the outer circumference of the barrel. Jerry used a stone with his Dremel tool to grind the inside bevel to match the factory original as closely as possible. Then he filed the outside bevel by hand, carefully eyeballing the width of the bevel as he went around the barrel to make sure it was even and consistent. Final touch up on the outside bevel was done with the Dremel tool using a diamond bit. When the bevels were done, Jerry went back to the grinder, this time with a cloth wheel and rouge to polish the end of the barrel before bluing. There were several steps in the polishing process before Jerry was satisfied. He used a cloth polishing wheel attached to his vertical drill press, periodically coating the wheel with polishing compound. We blued the barrel, tapped out a hole for the sight mounting screw and put the original target front sight back on the gun. It wasn’t long before I figured out this wasn’t going to work. Since I could now carry the Blackhawk in a regular holster, I found the backward slant in the target sight hung on the holster when drawing. So, I ordered a non-target sight from Ruger, mounted it to the barrel using JB Weld (I know, but it will be there as long as I’m around) and re-blued the barrel using Midway’s Oxpho Blue and I’m a happy camper! 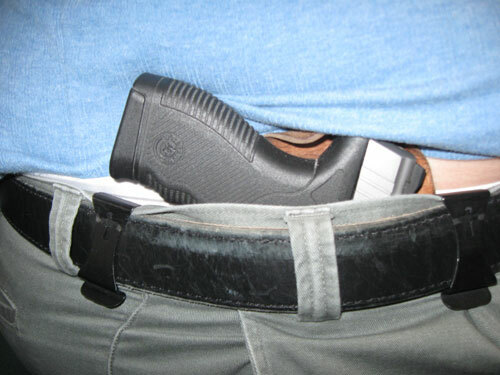 I’ve read a number of comments from magazine writers and bloggers about having a “drawer full of holsters” most of which were accumulated while trying to find one that works best for them as a concealed carry rig. Sometimes it’s a function of different holsters for different clothing. I’m very fortunate. 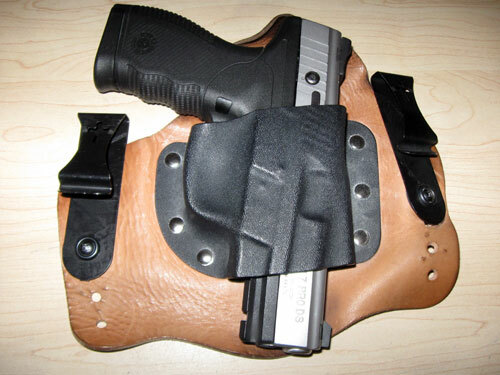 The first holster I tried after obtaining my Concealed Handgun License worked perfectly for my needs and continues to do so. I stumbled across the Crossbreed SuperTuck in a few forums and decided to try one. 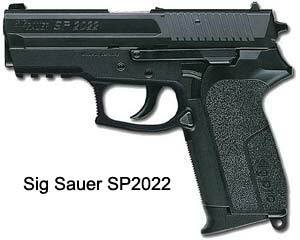 My initial carry gun was a Sig Sauer SP2022 and I ordered the holster to fit that gun. It also fit my Taurus 24/7 very nicely, though not contoured for it and was workable for the Beretta PX-4 Storm that I like to carry on occasion. My son, who is a lot thinner than I am doesn’t have the same luck with his Crossbreed which he uses to carry a Stoeger Cougar 8000. The other night we were going out to dinner and he watched me pick up my rig and stuff it in my pants ready to walk out the door in about 20 seconds. He said it wasn’t that easy for him. 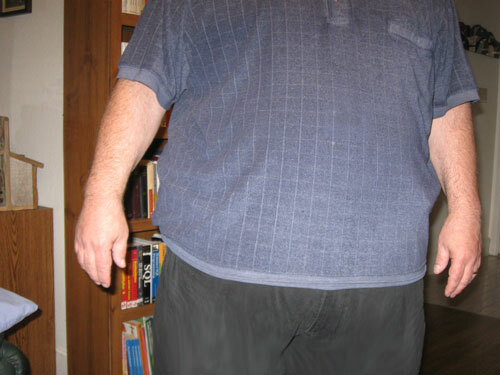 Here I am standing with a different shirt. The gun isnt visible at all. Heres how the gun rides at this position. 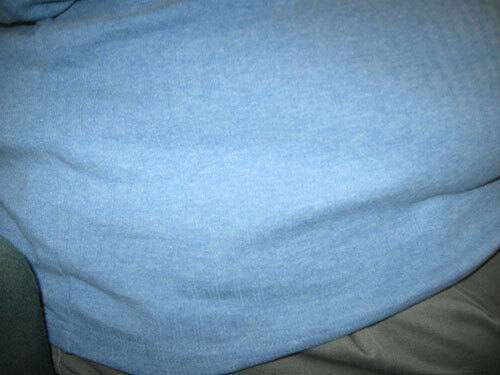 I simply lifted the shirt to show you. Heres my well-worn Super Tuck. 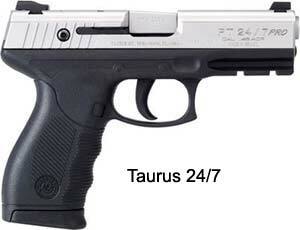 The Gun is a 45 Caliber Taurus PT 24/7. Dont tell the SuperTuck folks, who like to customize a rig for every gun, but I use this same rig for my Sig SP2022 and my Beretta PX-4 Storm. It fits the Sig perfectly, in fact, was probably made for it rather than the Taurus. 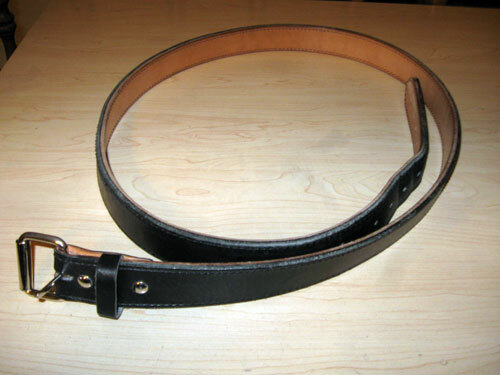 This heavy duty gun belt from Crossbreed turned out to be a necessity for me. I tried the holster for a month or two with regular belts because I didnt want to spring for the gun belt. Its a waste of time. 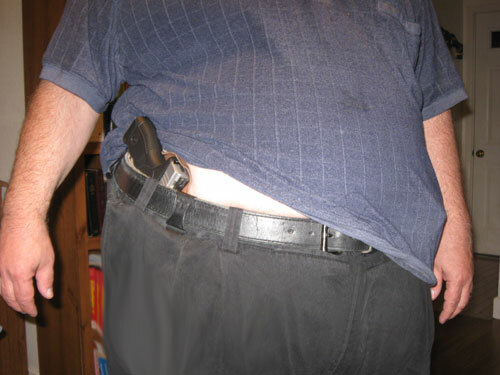 Get the gun belt, if youre staking your life on having a proper carry rig. These two pistols are similar in design, though more than a decade apart in orginal manufacture. Both were designed by Beretta and originally manufacturered by Beretta. However the Cougar 8000 was discontinued by Beretta some years back and in recent years returned to production by Stoeger, a Beretta subsidiary who manufactures the guns in Turkey. The two firearms share a unique design–a short-recoil, locked-breech system that uses a rotating barrel. When the gun is fired, the recoil impulse pushes the slide and barrel to the rear. After a short movement, the barrel is revolved by cam action against what is called the central block tooth, which is best described as an angled protrusion on the top of the locking or central block. This block rides on the recoil spring and guide rod inside the frame, turning the barrel as it moves back and forth. This unlocks the barrel, allowing the fired case to eject and then chambering a new round. This rotating design keeps the barrel in alignment with the target, potentially creating a more intrinsically accurate firearm. The barrel is throated and the frame relieved so that the chamber will accept a wide variety of bullet styles, reliably keeping feed malfunctions to a minimum. The models compared here are 9mm models, both were purchased in 2009 from Academy Sports. The Cougar retailed for $399. The Storm retailed for $519. The Cougar is all metal, the Storm has a Polymer lower housing. Weight (loaded) 28.5 oz 29 oz. Before we get to the photos, I must tell you that these two guns have been totally flawless in operation. We’ve fired hundreds of rounds of Winchester White Box, Federal, Monarch, and Remington FMJ ammo through them and several brands of JHP, including Winchester, Magtech and Hornady. Both guns are a pleasure to shoot. They are Double/Single Action, hammer-fired pistols with an external safety on the slide. Double-action trigger pull is very comfortable and the single action trigger pull is very light. 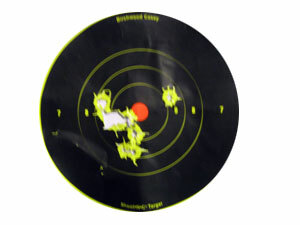 Both are very accurate out to 25 yards, shooting groups as tight as we can hold them.Hopefully, these pictures will help you with the subtle differences and the similarities.